A very rare NCO's version of the Swedish 1851 model cutlass (Flottans blankvapen: Änter huggare m/1851 för underofficerskorpral). 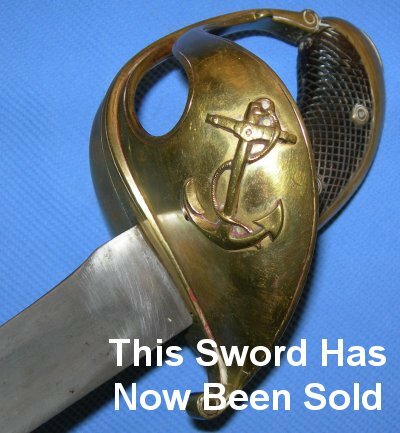 An exceptionally rare Swedish cutlass; just try finding let alone buying one elsewhere! 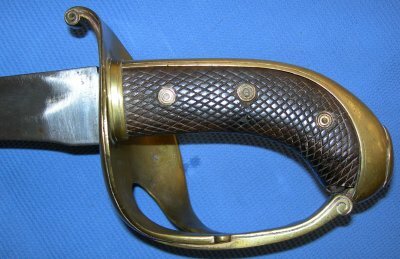 Most collectors will clearly recognize the form of a seaman's Swedish M/1851, not least the so-called "bolo" blade, but with a gilt hilt and hardwood grip for NCO's. The 27 1/2 inch bolo blade is in very good condition and firm in the hilt. The hilt still has most of its gilt. The hardwood grip ins in very good condition. An exceptionally rare cutlass from the fledgling small Swedish navy. Sure, you can find the regular basic seaman's cutlasses around, even some for sale. But not an NCO's cutlass like this one. Once gone, I doubt you will never get the chance to buy another one. Our price is a true bargain. Further / full sized images available upon request. Please quote our item reference number of B67.